War of Will looks to follow in the recent footsteps of International Star (2015) and Girvin (2017) in sweeping each of Fair Grounds’ Kentucky Derby preps when he goes favored Saturday in the Grade 2, $1 million Louisiana Derby. The Mark Casse-trained son of War Front leads a field of 11 going postward in New Orleans, where the season’s first major Derby qualifier — awarding points on a 100-40-20-10 scale to the Top 4 finishers — that should send at least the winner and runner-up on to Churchill Downs. NBC Sports Network will broadcast the Louisiana Derby and select undercard races beginning at 5:30 p.m. ET. Stick around afterward for a new “Road to the Kentucky Derby” documentary series beginning at 6:30 p.m. ET. The race can also be viewed on TVG, which will feature on-site coverage, or you can live stream it through advanced deposit wagering services such as NYRABets. 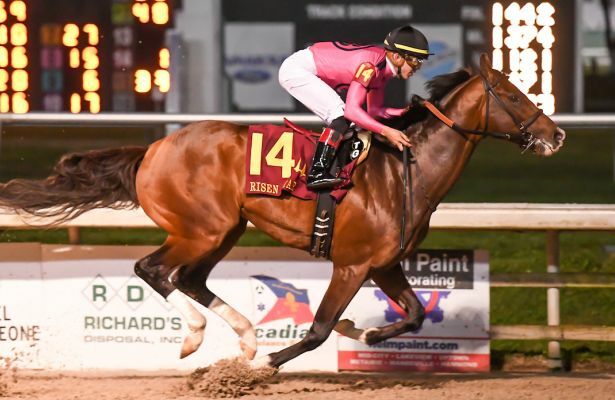 “No rival has yet made a dent in War of Will‘s leadership of the 3-year-old division in New Orleans this winter, but 10 will make a belated attempt to do so Saturday in the Louisiana Derby. “War of Will is already safely in the Kentucky Derby having accumulated 60 points by winning the Lecomte (G3) and Risen Star (G2) in comfortable fashion, but a third decisive win Saturday could put him in the discussion as a potential favorite on the first Saturday in May, not a bad position to be in of late with every public choice having won the past six years. “Despite being far back early in the field of 14 in the Risen Star, Country House advanced to second by mid-stretch and held that position at the wire, a positive stakes debut all around. Trainer Bill Mott has been an infrequent Kentucky Derby participant during his long career, but Country House could be one of potentially three runners for him come May 4. “Todd Pletcher has won this race more times — four — than any other trainer, and will rely on Spinoff to provide a fifth victory. The lightly-raced colt has won two of three, most recently an allowance at Tampa Bay Downs by nearly a dozen lengths. In his lone prior stakes try, he finished third to Call Paul in the Saratoga Special (G2) last August. “Sueno earned his lone stakes win on Tapeta at Golden Gate Fields, but has run well in two dirt tries since, finishing second in both the Sham (G3) and Southwest (G3). In the latter, he out-finished Long Range Toddy, who came back to defeat Improbable in the first division of last Saturday’s Rebel (G2).